How did Pillow Talk get started? Melanie: We started in the summer of 2013. Robyn and I both work for interior designers, so we’re always discussing the fabrics and textiles we source. 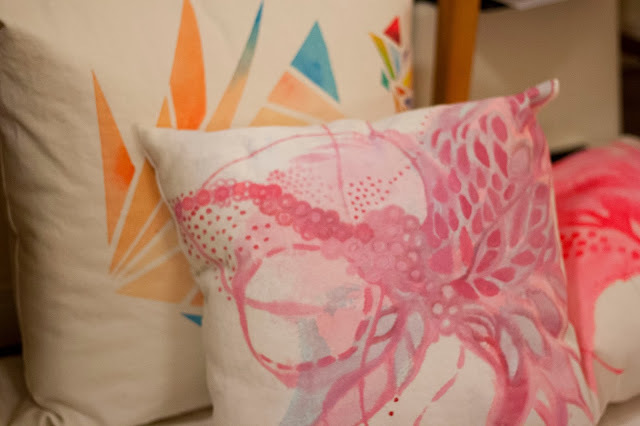 We’re also both painters; initially we thought about selling paintings but we wanted to incorporate interior design, so we decided to combine pillows and painting. Robin: We’re both studying interior design at Ryerson and after a grueling second year launching Pillow Talk was something fun to do that was both creative and completely separate from what we focus on at school and work. We were asked to participate in the "By Hand. With Heart" market at Dundas West Fest in June, which was our first event. I was part of Akin Collective in Parkdale with Oliver Pauk. I’m still very good friends with Oliver, and I noticed a call for artists on his Facebook page. We had really just started working on the pillows, so we decided to go for it. That’s when it got serious for us. Robin: I studied painting and drawing at Concordia University in Montreal. I've gone back to school for interior design, to pair a more practical degree with a creative one. I wanted to combine interior design with fine arts. Melanie: After finishing my undergrad degree in Political Science and Psychology at Queens, I headed down to New York and took architecture classes at Parsons. I decided I wanted to focus on design so I moved to Italy and completed a diploma program in Florence before returning to Toronto and enrolling at Ryerson. And I’m finished after this! Has it helped you with your business? Melanie: Definitely. Since we both work for interior designers we deal with paint colours, textiles and décor everyday. It's helped us to decide what we want to contribute to the market. Robin: Working together has been great too. We’re similar but our backgrounds are very different so we can marry practicality and design with the different skills that we have. Tell us about your pillows. Where does your inspiration come from? Robin: I think our inspiration comes from painting, drawing and sketching. We’re both constantly sketching. We look to fashion for inspiration, especially for colour trends. It’s also interesting to see the different fabrics in showrooms we go to for work. From there we look at different patterns and think about how we can do something that is as unique. When you’re painting directly onto cotton canvas you can be so free, there are so many different things that you can do. 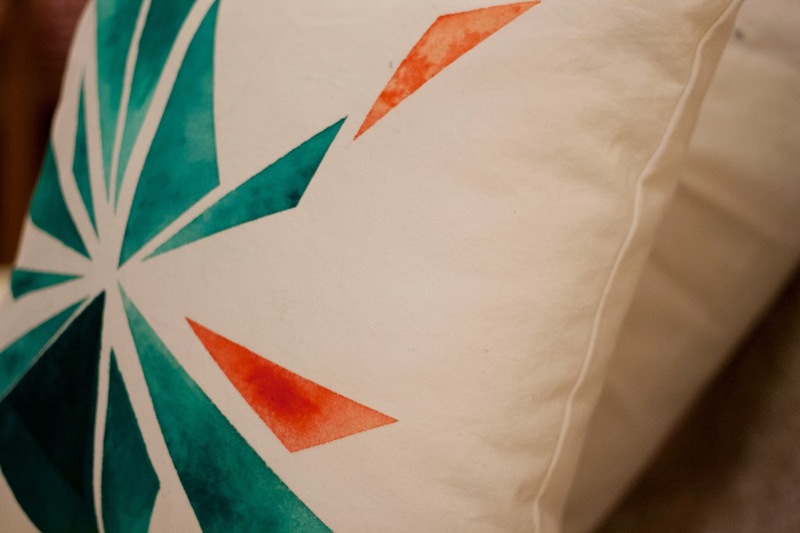 All our pillows are hand-painted, and they are all so different in how we start each one. Some of them are really precise, where we use a stencil, and some are completely free hand with a water colour approach and multiple layers. Each piece is unique and different. We've noticed that most people like mixing both styles and patterns in similar colour palates. It’s very effective. And it’s our hope to avoid over matching, to be more eclectic. 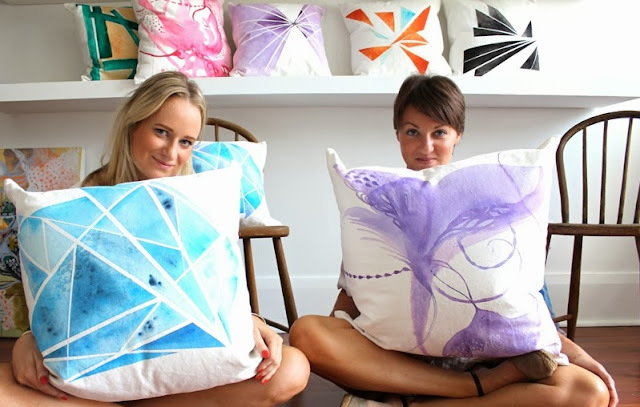 How long does it take you to create a pillow? Melanie: We start by sourcing our fabric. Then we take it to our tailor who sews the cases. After we pick up the cases we start painting. This process varies depending on the pattern. And often we start something and then go back to the pillow and add a second tone or layer to give it more depth. 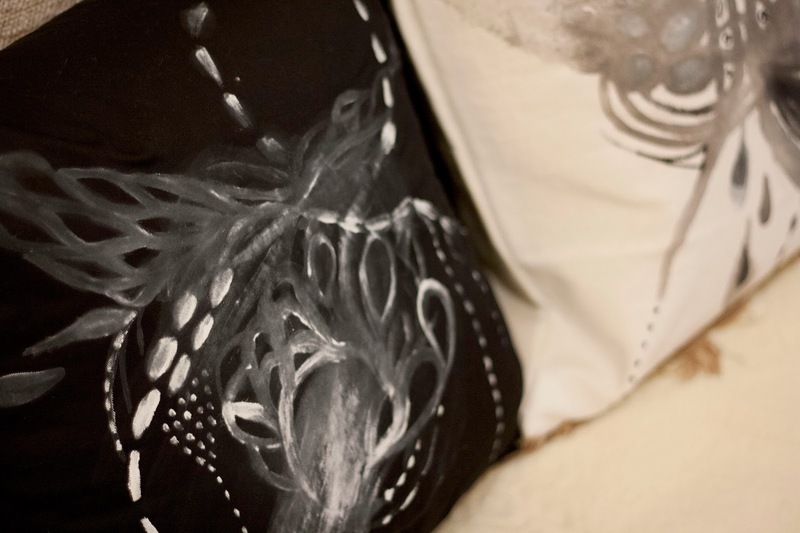 The black and white pillows take longer because using the white paints means you have to be very precise. Plus time for drying and heat to set the paint. Start to finish it could take anywhere from 1 to 3 hours. Melanie: It’s running around doing errands. In the summer when we had a few days off work we would spend time going to showrooms to source fabric, picking up fabric, bringing it to the tailor, sourcing the zippers we wanted to use. We’re at a point where we've figured out those kinks - we've got a system but it’s still a lot of running around. 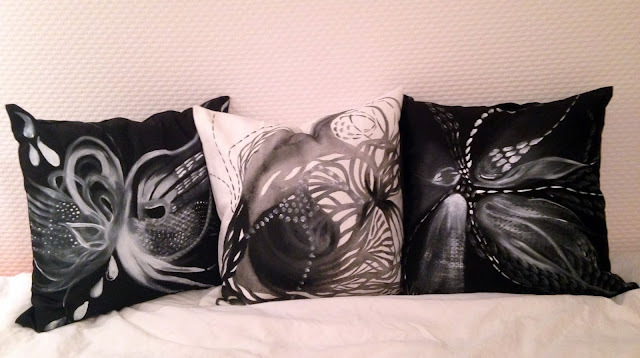 Robin: But once the pillows are done, it’s fun to play around and arrange them into collections. That’s the best part. It was fun when we did the House & Home shoot at Cambie Design, because it's a completely white space. It was great to be able to display them on shelves and move them around. It really highlighted the designs and product. Robin: For me I think it’s because I really feel that I'm at a point where I can merge my fine arts and design skills. 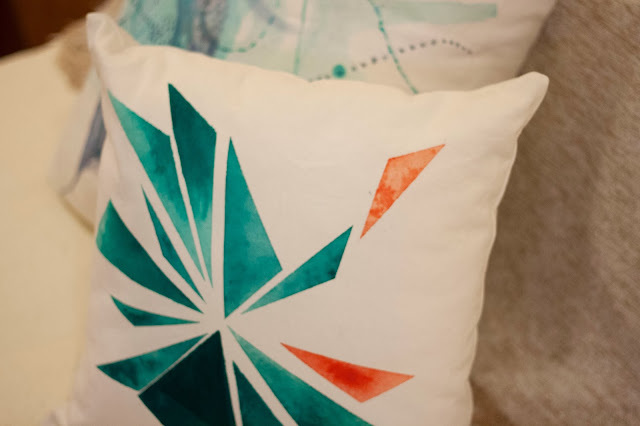 For every interior designer fabric and throw pillows are like pieces of candy that can go into a room, so to be able to create that yourself is something I find exciting. Melanie: I like the freedom of it. We’re not stuck doing a certain style or working with a certain colour. We’re constantly doing new things – we can take a doodle or sketch that we do in class and turn it into a new design. Sometimes it works and sometimes it doesn't but we don’t feel bound by anything. It’s the one thing we have for ourselves. When it turns out and it’s a success, it's gratifying. Would you say there’s been a tipping point for your business, or is that still to come? Robin: In general, I think that’s probably still coming, but I think having the press with House and Home really helped us since it’s a design magazine. It gave us a little bit of a name. Melanie: After Dundas West Fest we got a few emails and custom orders. We did a show for our black and white fall line and those all sold. That was pretty successful. Robin: Keep doing it and don’t be afraid. People really appreciate one of a kind pieces. You don’t know unless you try. It’s funny because the pillows we considered mistakes were the pieces people really wanted. Melanie: You have nothing to lose. Experiment along the way, until you figure out what you like and what works best for you. What’s next for Pillow Talk? Melanie: We’re going to focus on custom orders until the spring. Then we’ll start working on new patterns and colours. We’d love to eventually do the One of a Kind Show; it’s on our radar, but only when we’re ready. Robin: We have our pillows at Y & Co. right now, which is a rug and fabric store popular with designers. We’re hoping that through that connection, people start noticing and ordering our pieces. Where can shoppers find your pillows? Email pillowtalktoronto@gmail.com for custom orders, visit the Facebook group to view samples or Y& Co. in Toronto.